One of my all-time favorite Christmas presents from my husband and sons was a goat. Actually, I got a card with a photo of girl cuddling a baby goat, and the real creature was sent to a Guatemalan village. I keep the picture of the girl and goat in my bedside drawer along with a few other treasures. Glimpsing it makes me smile as I imagine a family enjoying fresh milk, cheese, and yogurt from our goat. But what if I'd had to strive and plan and scrimp and invest in order to afford the goat? Wouldn't my connection to that faraway family be even stronger, and my delight even greater? 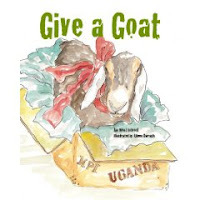 In GIVE A GOAT (Tilbury House, 2008), author Jan West Schrock taps into her family's heritage with Heifer, International to demonstrate the joy of working hard to give. With captivating, humorous illustrations by Aileen Darragh, GIVE A GOAT tells the story of a fifth-grade class deciding to join the war against poverty, and serves as the perfect how-to guide for any classroom, scout troop, youth group, or homeschooling family. Schrock's book shows how embarking on a project like this in the tween years can teach valuable math, teamwork, brainstorming, and business skills. But best of all, raising money to send a goat or cow or pig to a family in need might inspire our children to become lifelong givers. To celebrate the book's release, Tilbury house is giving away two copies. To qualify for this giveaway, leave a comment telling us about a children's book that inspired you or your kids to compassion. I'll pick two winners at random, and also compile a list of titles.